You can configure or change the display settings of your new iPhone 6 smartphone, to have a Home screen appearance as you desire. This guide will walk you through customizing your new iPhone's display, particularly the Notifications in the Notification Center. Apple's latest iPhone 6 integrates a notification center to display notifications on missed calls, new messages, etc., in the status bar at the top of the screen. 2. Next, tap on Notifications. 3. Choose sort order for notifications like manual sorting or by time. For manual sorting, tap on Sort Manually, otherwise, if you prefer to sort notifications by time, tap on Sort by Time instead. 4. 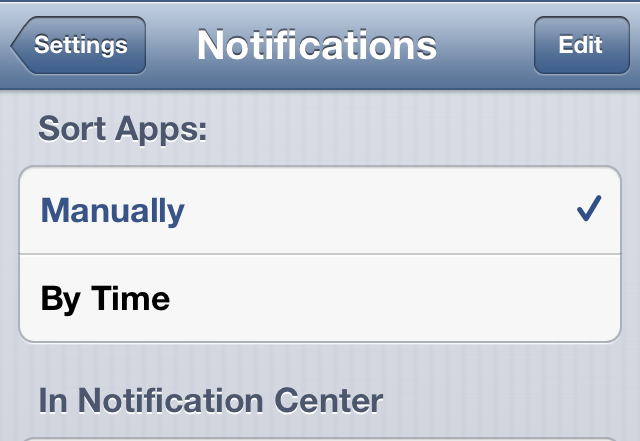 Now choose your preferred settings for notifications by pressing the required app from the given apps under Include. 5. Tap the indicator next to Allow Notifications to turn the display of selected notification on or off (enable/disable function). 6. Tap on Show in Notification Centre and specify the number of notifications to show. 7. Select any from the given options under Show in Notification Centre, including No Recent items, 1 recent item, 5 recent items, and 10 recent items. 8. After you've selected an option, tap the field at the upper-left corner of the screen. You will then be taken back to the Phone screen/menu. 9. Now turn lock screen access on or off, from the Phone screen. To do so, scroll to and tap the indicator next to the option to Show on Lock Screen. You may choose to disable or enable this function. 10. Next, change the display format of the notifications. To do so, tap to select your preferred format below Alert Style When Unlocked. Just tap on the sample format you prefer. You can have access to and configure more options depending on the application you choose. Just follow the on-screen instructions to choose the required settings (if you want). 11. When you're done configuring option settings for the notification center, tap Notifications to save the changes you've made recently to the settings. 12. Tap on Settings, to continue. 13. Now press the Home key to go back to the Home screen. 1. Hold the status bar located at the top of the screen and then drag it down. 2. Tap Today or Notifications to proceed. 3. Tap to select a notification from the available options. 4. Follow the on-screen instructions to use the selected option/function. And that covers the basic configuration of notification options in the Notification Center of the new iPhone 6 device. More tutorials on the iPhone 6 display settings will be offered in this site. So keep posted.